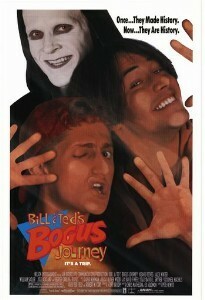 Bill & Ted's Bogus Journey is a 1991 American science fiction comedy film, and the directing debut of Peter Hewitt. It is the second film in the Bill & Ted franchise, and a sequel to Bill & Ted's Excellent Adventure (1989). Keanu Reeves, Alex Winter and George Carlin reprise their respective roles. The film's original working title was Bill & Ted Go To Hell.